The news of the closure of Jarrow’s visitor attraction Bede’s World was disheartening. It was one of England’s very few museums solely devoted to the Anglo-Saxon past and I fondly remember visiting the place several years back (one of the highlights of my visit was adopting Hilda the pig via the animal adoption then still in place). I have always promoted Bede’s World in my lectures and I am happy to say some of my Dutch students visited the place (at their own initiative!) in early 2016. (update: In August 2016, it was announced that Bede’s World will be relaunched as Jarrow Hall (more info here) and rightly so!). With this blog I just want to share one of the many reasons why the Anglo-Saxon monk and scholar Bede (672/673-735) deserves his own museum: the man’s theological, exegetical and mathematical works are filled with interesting tidbits! Bede had a wild side! The Venerable Bede [left] and Bear Grylls [right]. We don’t know his stance about drinking his own urine, but we may consider calling him ‘Bede Grylls’ from now on. Bede compared teachers to dogs! 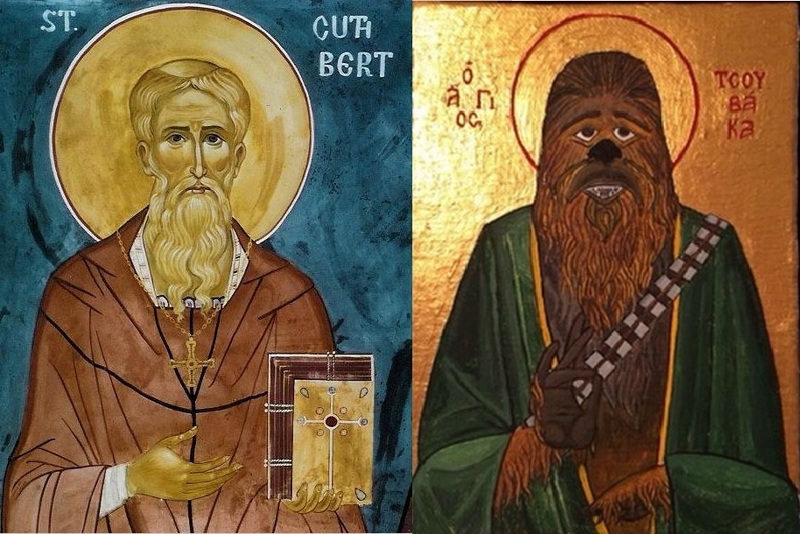 In his commentary on the book of Tobias, Bede noted that teachers are like dogs “because they defend their Master’s spiritual household, wealth, and sheep from thieves and beasts, that is from unclean spirits and heretical persons. … This figure aptly fits them since dogs naturally show gratitude to those who are kind to them and keep a restless watch for the sake of their masters” (trans. Trent Foley and Holder 1999, pp. 64, 74). Bede continues that, just as a dog rejoices “with the adoring wag of its tail … the limit or extremity of the body”, so too teachers rejoice with “the extremity of good work, which is perfection” (trans. Trent Foley and Holder 1999, p. 74). As a teacher (and dog owner), I couldn’t agree more! 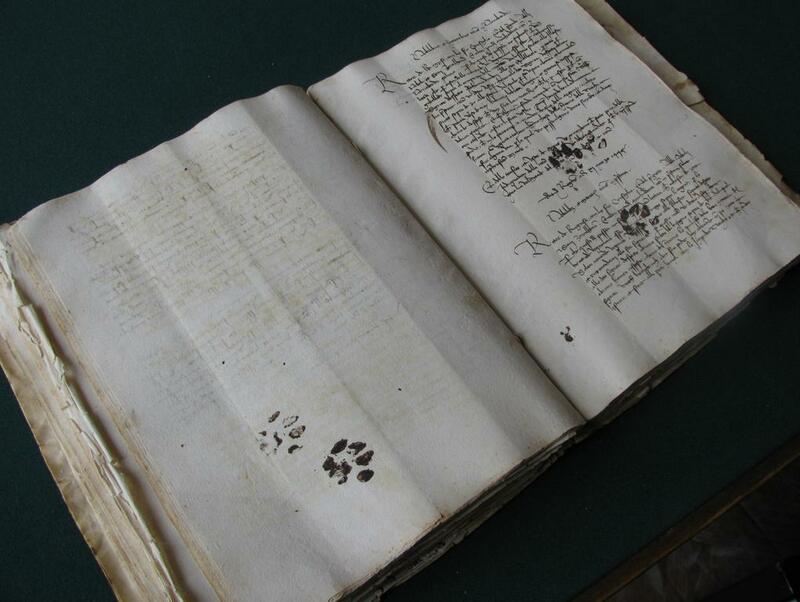 Breca the pug (right) reads Kathleen Walker-Meikle’s Medieval dogs (and finding Bede [left] not mentioned!). Bede knew the right questions to ask! In his commentary on the book of Genesis, Bede discusses the miracles involved in the Ark of Noah. After discussing the size of the Ark and the duration of the Flood (a full year), Bede notes “that all the things that were done in it [the Ark] or in connection with it [the Ark] were full of miracles of divine power” (trans. Kendall 2008, p. 183). How else, he asks, could eight men feed all of those animals for a year’s time? Where did they store the food? If all those animals had to stay in the same place for one year, how did they keep their health? Surely those were all divine miracles. 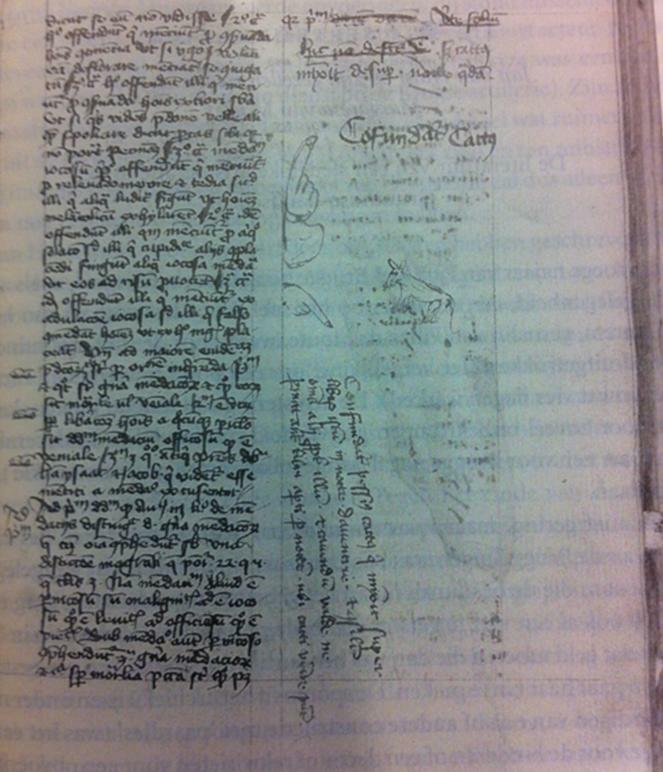 A valid question, mister Bede: what about the poo!? The things Bede could do with his fingers! Most of us will be able to count to ten with our ten fingers; Bede, however, could reach 9999, as he explains in the first chapter of his De Temporum Ratione [On the Reckoning of Time]: De computo vel loquela digitorum [On computing and speaking with fingers]. With the pinkie, ring finger and middle finger of his left hand, he could count to 9 (see the ninth-century manuscript image below for instructions), with his index finger and thumb he could make 10, 20, 30, etc. Then, using his right hand, he could make the hundreds, using his pinkie, ring finger and middle finger. With the index finger and thumb he could make the thousands. Bede was pretty cool. Rock on, mister Bede, or rather: 5454! 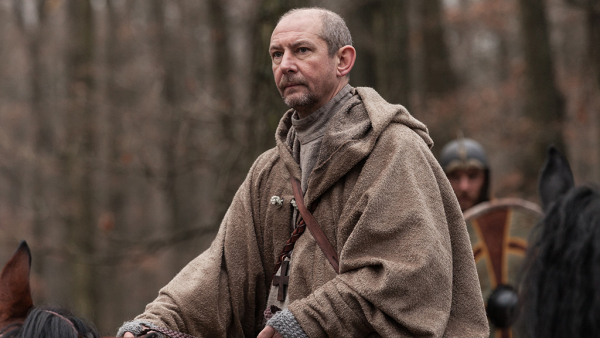 During the early Middle Ages, several Anglo-Saxons made their way to what is now the Low Countries, as missionaries, pilgrims, mercenaries and refugees. On this blog, I will regularly shed light on places in The Netherlands and Belgium associated with these visitors from early medieval England. 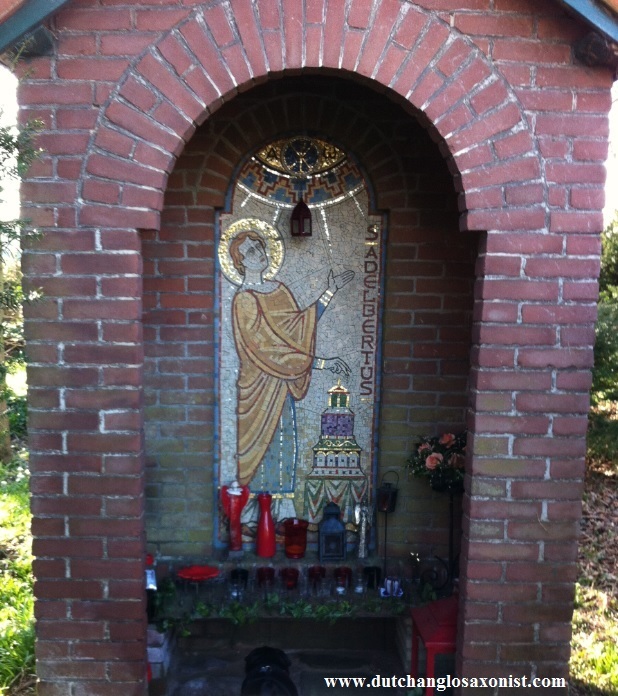 This post focuses on the Anglo-Saxon saint Adalbert of Egmond (Feast day: 25 June) and the site where he had once been buried: Adelbertusakker, Egmond. Upon entering the Adelbertusakker (Google Maps location here), you are greeted by three life-size wooden carvings: Dirk Schuit (a man who lived there in the 19th century), Count Dirk II of Holland and St Adalbert. Walking a little further up field, you’ll find trees, benches to sit on, a shrine devoted to St Adalbert and, on the ground, the outlines of where from 1152 to 1573 a stone church had stood. The centrepiece of the field, however, is Adalbert’s well, which is still fully functional. Adelbertusakker, Egmond. Left: Outlines of late medieval stone church; Right: Well of Adalbert. 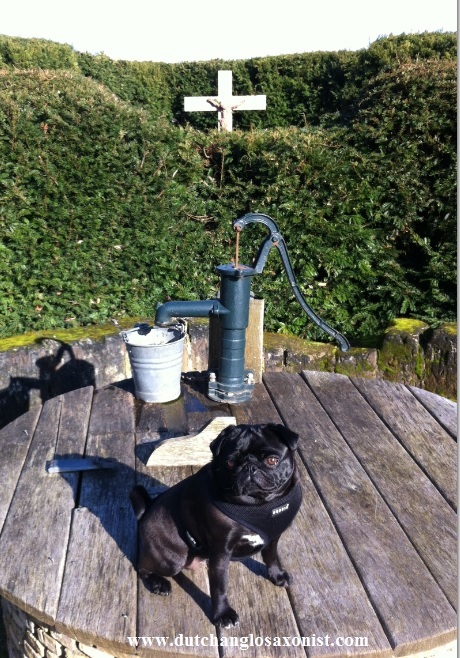 Breca the Pug and the well of Adalbert. Water from the well can still be drunk and, according to some, it has retained its medieval miraculous powers. In the 18th century, in particular, water from the well was used to heal cows and other livestock. Needless to say, my pug Breca had her fill as well (and she is still in good health today!). Interestingly, a nearby abbey (named after Saint Adalbert; I will devote another blog to this in the future) uses water from the well to brew its own beer. 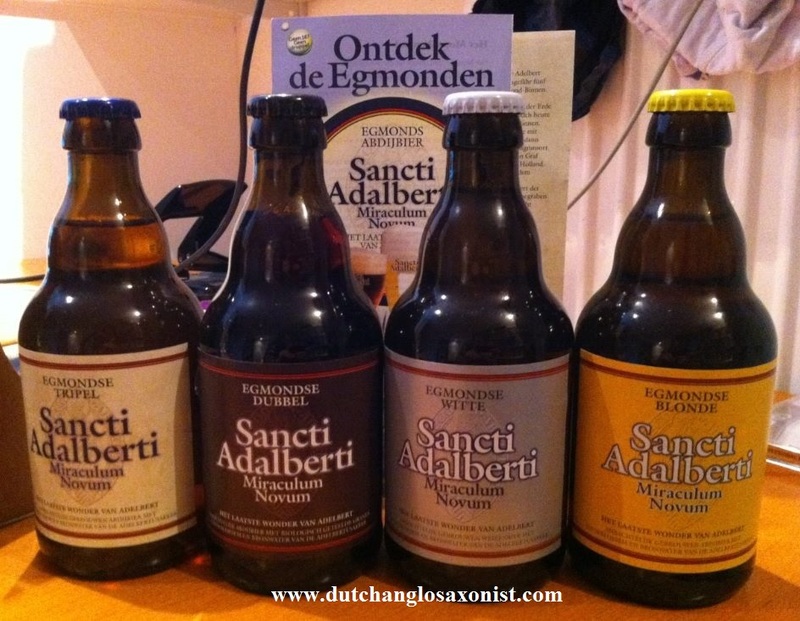 The beer is entitled ‘Sancti Adalberti Miraculum Novum’: the latest miracle of Saint Adalbert.